00:35:00 Makes 24 servings, 1 cupcake (68 g) each. Makes 24 servings, 1 cupcake (68 g) each. Sure, you've tried classic black forest cake but have you ever had a Black Forest-Stuffed Cupcake? 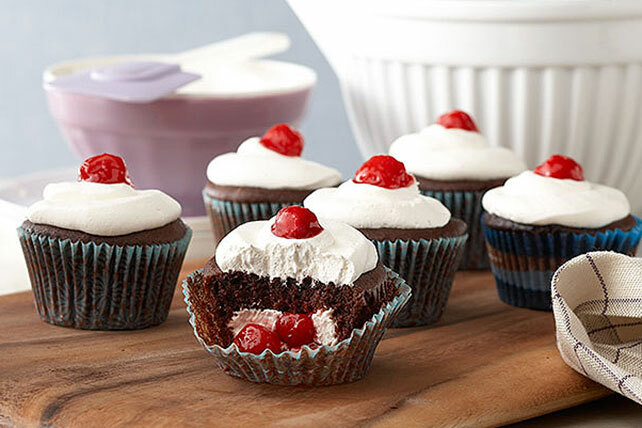 Now is your chance - bake up a batch of chocolate cupcakes with cherry pie filling and a cream cheese centre and then finish them off with a dollop of COOL WHIP. Prepare cake batter as directed on package for the light or low fat version; set aside. Mix cream cheese, egg and sugar until well blended. Reserve 3/4 cup of the cherry pie filling for garnish. Spoon 2 Tbsp. cake batter into each of 24 paper-lined muffin cups. Top each with 1 Tbsp. each of the cream cheese mixture and remaining cherry pie filling. Cover with remaining cake batter. Bake 20 to 25 min. or until toothpick inserted in centres comes out clean. Cool 5 min. ; remove from pan to wire racks. Cool completely. Top with Cool Whip and reserved cherry pie filling just before serving. Store cupcakes in tightly covered container in refrigerator up to 3 days. Prepare as directed, except substitute lower fat or light directions for cake mix preparation, Philadelphia Light Brick Cream Cheese, light cherry pie filling and Cool Whip Light Whipped Topping. Serving Size Makes 24 servings, 1 cupcake (68 g) each.